While Halloween and trick-or-treating definitely exists in Germany, it doesn't seem to be quite as big of a deal as in the States. We don't usually do much on this holiday anyways, but this year we ended up going over to two of our friends' places for a dinner, scary movie, and pumpkin carving. The meal was an impressive rolled, stuffed slice of meat along with a homemade mushroom soup. The movie was Scream 4, which I didn't know was still going strong. 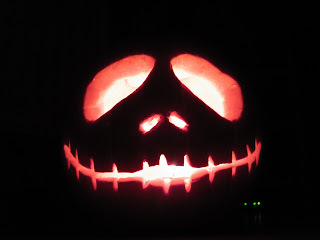 The carving was inspired by "Jack" from the Nightmare before Christmas, which incidentally is a great movie for both Christmas and Halloween. One cool thing around Frankfurt is a haunted house thing they do at Burg Frankenstein (Castle Frankenstein). We didn't make it this year, but some coworkers said that it was pretty legit with professionally done-up characters crawling around the grounds and scaring the mess out of folks. I think they also do choreographed shows and dinners as well. Maybe next year.